Intro from Jay Allison: Adding to his reviews of new digital audio recorders, our Tools Editor Jeff Towne now presents a comprehensive test of the Zoom H2, focusing on field recording for radio. As ever, it aint perfect, but it has some unusual capabilities, along with the customary weaknesses common among these little machines. Jeff says, The Zoom H2 is a very convenient small recorder, and can give remarkably good sound when using its internal microphones. Its especially good at picking up musical performances or collecting stereo ambiences of events that are at least moderately loud. Come by Transom to see the full review and listen to sample recordings. In the widening field of flash-memory recorders, the Zoom H2 stands out with a few unique twists. Like the Edirol R-09, the M-Audio Microtrack, the Zoom H4 and the Marantz 620, it’s a pocket-sized device with built-in mics, designed for quick and easy recording to SD memory cards. Unlike those devices, the H2 has four separate microphones, to be used in pairs, or all at once. One pair of mics points out the face of the unit at a 90 degree angle, the other pair points out the back with wider coverage. Those microphones do a great job at picking up vivid stereo ambiences and, unique to this recorder, sound from all directions at once. The H2 looks a bit like an old-fashioned announcer’s microphone, and is intended to be used like one: oriented straight up, addressed from the side, rather than pointing the end of it at the sound source. Like most of the small recorders, it’s most successful running autonomously, recording from the built-in (or provided) microphones, rather than interfacing with external equipment. The H2 is fairly simple to use, and once set-up to record in the format preferred, can be rolling in only a few seconds from power-up. Record levels can be set from hardware switches, no menu navigation necessary. Level metering and elapsed time information are displayed on a smallish, but sufficient screen. It’s powered by two double-A batteries, and will record for about 5 hours on a set of fresh alkalines. Most importantly, it can fit in a pocket, so it’s easy to carry everywhere, ready to capture sound on a moment’s notice. Hand-holding the H2 is problematic, because the plastic body transmits handling noise readily. With a little practice, one can develop a light touch that will mitigate the problem, but especially due to its upright orientation, it’s often easier to set it on a stand. The H2 has a threaded socket its bottom that can mount on any standard photo tripod. It also ships with a handy plastic foot that screws in that receptacle. Additionally, an included plastic handle can be attached to that socket, providing a steady insert to a microphone clip. One could use that handle to grip the H2, but it does not do much to insulate the recorder from handling noise. Zoom suggests wearing a glove, but padding the handle with some foam might be more practical. The H2’s physical layout is simple: a headphone output,which doubles as a line-out, is along one edge, along with its volume rocker switch, the on-off switch, and a power input. The other edge has 1/8" mini jack inputs for external mic input, or external line-level input. The mic input can provide "plug-in power" to small electret microphones that need it. That low voltage current can be turned on and off in the utility menu. It’s important to note that the Zoom H2 can NOT provide 48 volt "phantom power" to professional condenser mics, so if you wish to use such a mic, it needs to be powered with an internal battery in the mic. Not all condenser mics can use an internal battery, so be careful in choosing an external mic if you use one. Next to the microphone input is a level control for both internal and external microphones. This coarse Low-Medium-High setting, in combination with the finer "rec level" + and – buttons on the face of the recorder, can set the input gain with a high degree of accuracy. One would want to set the inputs so that peaks were bouncing somewhere up near -6 dBfs. As with most of these small recorders, they’re best suited to record loud events, and one may have some trouble getting sufficient input gain when recording quieter sounds, such as an average interview. In most cases, one must set the input gain to "High" and then turn the "Rec Level" up pretty high in order to get the levels bouncing healthily when recording a basic conversational voice. Turning those input gains up very high will introduce some hiss and other noise, so keeping the input gain lower by using higher-output external mics or recording louder events, will result in less noise from the H2. Sadly, external microphones do not sound especially good with the H2, even very high output condensers produce a soundfile with a lot of hiss. The internal mics do not suffer from this as much, but using even high-output professional external microphones generally gives a disappointing, noisy result. 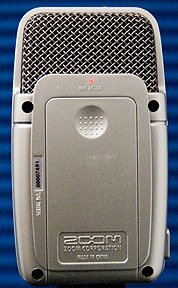 The external mic input is low-impedence, so an impedence-matching transformer such as the Shure a96f does not add any level, as it does with minidisc recorders or video cameras with high-impedence inputs. But the internal mics do remarkably well, especially for recording you-are-there ambiences or music performances. We tested it in a casual livingroom jam featuring Chandler Travis, Steve Shook, Phil Kaplan, and Jake Shapiro. Surprisingly, bypassing the mic input altogether by amplifying the mic with an external mixer and coming in the line input creates a different problem: the signal is cleaner, but low in level and clipped in the louder sections. The clipping was clearly visible when inspecting the waveform of the recorded soundfile, even though all levels were clean at the mixer, and input meters on the H2 were showing safe levels. The H2 offers various processing on the inputs: Automatic Gain Control, Compression and Limiting. The AGC is fairly effective on the built-in mics, but problematic with external mics. The Compressor and Limiter functions act mostly the same way as the AGC, providing some dynamic control with the internal mics, but not completely protecting from clipping. The unique design of the H2 allows for some unusual recording options. The front pair of mics is aimed in a relatively narrow 90 degree angle from one another. The rear microphones are aimed further apart, in a wider 120 degree angle, better for picking up larger groups, or creating a wider stereo image from general ambience. Other than the direction they’re pointing, the mics are identical. If a single voice is being recorded, it makes sense to remember which direction the mics are pointing and aim one of the elements directly at the sound source. It’s a little hard to hear this while monitoring both channels, but aiming one of the elements directly at the sound, by twisting the H2 a little off to one side, then only using one channel of the resulting stereo soundfile, gives a more present, immediate sound than simply pointing either face of the recorder straight at the source. Which set of mics is active is controlled by clicking on the right or left arrows on the face of the H2. A red LED lights up showing "Front" "Surround 2Ch" "Surround 4ch" or "Rear." Additionally, another red led "Mic Active" indicator lights up just below the grill covering the mics, on either the front, or back, or both. The ability to record from all four mics simultaneously is significantly different from any of the other pocket-sized recorders. In "Surround 2ch" mode all four mics are recorded to a single stereo file. In "Surround 4ch" mode, two stereo files are recorded. They are saved in the 4ch folder and named with F and R to indicate the front and rear mics. Those two stereo files can be loaded into a multitrack editor and balanced afterward, even split into 4 mono tracks to allow for even greater adjustment. These surround modes can be used to record several people around a table, the recorder placed in the middle. Or one could capture a more natural conversation where moving a mic would be distracting, by placing the recorder directly between the two subjects. Or one could place the recorder in the midst of a musical performance, or other interesting ambience. Audio is easily transferred to the computer via the mini USB connection, although it requires activating "USB storage" from the menu. Removing the SD memory card and using an external card reader provides faster transfer of the sometimes large files. The H2 can use most standard SD cards and some larger SDHD cards with capacities up to 8 gigabytes. The compatibility of newer larger cards is always going to be in flux, but to be safe, consult the manufacturer for approved brands and models. The menus are easy to navigate, most options available with only a few button pushes. "Menu" enters and exits the menu, the right and left arrows navigate up and down the options, and the center red "record" button selects between the options. Low frequency Cut – reduces low rumbling frequencies from wind or handling. record mode – select bit-depth (16 or 24) and sample rate (44.1 khz to 96khz) for .wav files, or rates for lower-quality MP3 recording ranging from 48 to 320 kbps (also supports Variable Bit-Rate MP3). Recording is restricted to 16 or 24-bit and 44.1 or 48 khz .wav file recording when in surround mode. AGC/Compressor – automatically controls audio levels. File Browsing – allows review and management of recorded soundfiles. Input Monitor – sends sound from the inputs to the headphones even when not in record or record pause. Plug-in power on and off – for certain small electret microphones. Pre-record – puts a few seconds of audio continually into a buffer, so one can start recording a few seconds before pressing record. Auto record – starts and stops recording automatically when sound reaches a defined volume threshold. It will only turn on and off once. Mono mix – records the left and right microphones equally to both channels of the stereo file. Metronome – provides a steady click for musical practice. Tuner – surprisingly competent guitar tuner. Play mode – allows single or repeated playback of single or multiple soundfiles. AB Repeat – allows repeated play of a section of a soundfile. Light – controls how long the display backlight stays on after buttons are pressed. Contrast – adjusts the brightness of the display for various lighting enviroments. Battery – by setting this to reflect the type of AA battery being used (Alkaline or rechargeable NiMH) the display will show a more accurate battery life indication. SD Card – tells remaining space on card, or allows reformatting (erasing) of card. USB – activates file trasfer via USB, or enables the H2 as an audio interface. Date/Time – sets the clock and calendar for timestamping of files. The preferences one saves in these menus are stored on the SD memory card, and will remain as you left them next time you power the unit on, unless you completely reformat the SD card. If you need to do that, you may wish to copy the "SYS" folder from the SD card onto your computer before reformatting the card. Then copy that folder back onto the SD card, and your settings should be as you adjusted them. Or simply delete files and folders from the SD card, except for the folder named "SYS" rather than reformatting. The H2 can also function as a USB interface, for recording directly into a computer. All the same caveats apply as when using it as a stand-alone recorder: the internal mics are pretty good and external microphones are problematic in terms of noise. 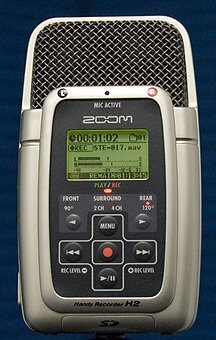 The Zoom H2 is a very convenient small recorder, and can give remarkably good sound when using its internal microphones. It’s especially good at picking up musical performances or collecting stereo ambiences of events that are at least moderately loud. Internal noise resulting from turning the input gains all the way up make it ill-suited for recording very quiet, delicate events. And using external microphones, as would be preferable for most interviews, gives poor results overall. So this machine can be a valuable tool in the recordist’s kit, but won’t be suitable for all circumstances. But its price, size and flexibility make it attractive as a recorder to carry at all times, in order to capture spontaneous moments, or to dedicate it to specific tasks, such as recording ambiences, demos and musical performances. This is a fantastic little machine – highly recommended. A couple of issues which appear in the fora: You can’t pause during recording. You can’t see Time Remaining during playback (useful when playing a clip into a live report). The settings are not retained when you change the SD card. File transfer is slow. You need the pop shield for field interviews. I imagine these will all be sorted with new firmware. As for losing settings when changing the SD card – it’s true that the settings are saved on the SD card itself, but if you have one or more cards dedicated to using in the H2, you can copy the SYS folder from the SD card that was installed when you set your prefs onto your computer. The copy that folder onto any other cards, and keep a copy on your computer to copy back onto any card you reformat. And you’re right, file transfer is slow, so I highly recommend getting an SD card reader that will transfer data at a higher rate. I forgot to mention the pop filter – the H2 ships with a foam sleeve that slips over the top of the machine, protecting the mic elements from wind, or P -pops, at least somewhat. A thin layer of foam can only do so much. I noticed that the mini Windjammer furry cover I got for my Rode NT4 stereo mic will fit over the H2! Might have to try that and see how it works. You mention this recorder in the review but it just started shipping. The first review, that I’m aware of just appeared. "When recording with the built-in mics and volume set to maximum, a broad-spectrum hissy background sound is noticeable. After plugging in external mics, the preamp becomes much quieter. At a gain setting just lower than maximum, the recordings I made with a Sennheiser ME20/K6 mic were very clear and sounded natural. Compared to my Oade-modified PMD660, the PMD620 was a bit noisier, but sounded very good as long as the preamp gain was held a little below maximum. Overall, I’d say the PMD620’s preamp is better than the stock PMD660, and similar to the well-regarded Sony Hi-MD minidisc recorder…. With external mics, the PMD620 is capable of excellent performance." I’m testing out a 620 right now, and will have a review up soon. I’m not sure any of these little guys are ever going to satisfy nature recordists, trying to capture delicate sounds in very quiet environments. That said, it is indeed true that the 620 sounds pretty darn good with external mics, even though it only has an 1/8 inch minijack input. When using external mics, the noise level and overall sound quality is SIGNIFICANTLY better than any of the other small flash recorders I’ve tested. BUT – there’s always a but isn’t there? There are a couple of very strange quirks that I’m still trying to rank as minor annoyances, or serious deal-breakers. The most eggregious is that there’s a latency in the headphone monitoring. That is to say, while recording live sound, there’s a slight delay in the headphones. There does not seem to be any way to get the phones to monitor the inputs directly. It’s maddening. 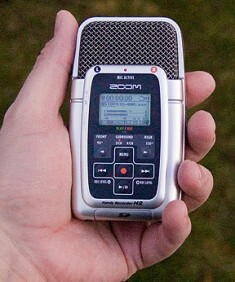 The other big thing is that the headphone jack is placed on the top end of the recorder, right between the built-in mics, so if one is using headphones to monitor, and using the built-in mics, the cable is protruding out from the machine, in a particularly distracting way if one is sticking the recorder in close to an interview subject. It also seems likely to flap around an make noise. A couple other little things… I’ll do a full run-down soon. But in the meantime, the short version is that the Marantz 620 sounds very good with external mics of any kind, even dynamic omnis, much cleaner than a stock 660, or either of the Zooms. And the ergonomics of using the device are mostly very good: push the big record button once and you’re rolling, input gain can be adjusted from up/down buttons on the side . But there are some issues that make it irritating to use. So close! Stand by for a full review. Just to be clear: from initial impressions, the Marantz 620 seems to be quieter when using external mics than the other small recorders. The larger recorders, specifically the Sound Devices 722 and the Tascam HDP2, still sounded better than the 620, but those are much bulkier, and more expensive. line in works just fine! I disagree with the author about the line in clipping. I have now recorded a few live performances using preamps and a limiter and then out to the H2 with great success. Here’s the setup. Keep the gain setting at 100. Don’t bother with the 0-127 at all. If possible keep the setting on the side at Medium. Read why at the zoom forum the author above didn’t explain any of that stuff. Check out the thread called "how to get the most out of your zoom H2". Make sure that the gain levels you’re feeding into the H2 aren’t peaking. If needed, turn down the output of the preamp a bit. I bring along a limiter for extra security and set the threshold just under -.5. The line input is a bit hotter than other devices. You need to tame it down. My guess is that the author chose to tame it down in the digital domain by changing from the default of 100 to some lower number like 80 or whatever. As discussed on the zoom forum, that may appear to not clip in the H2 meters, but it is misleading. What is happening is it is clipping in the alalogue realm, then the volume is being lower. So you’re gettting a clipped sound wave that appears to not be clipping in the digital domain. Leave the setting at 100. Ignore the option to change it, it only masks problems you may be having. The workaround is to make sure your signal level isn’t overloading as it enters the H2’s line input. If it’s too hot, lower it before it comes in! Once you do that, all’s good! I’ve recorded a few concerts using the H2 with no problems, once I learned this. Nope, that’s not it… I did several tests trying to get a clean line-level signal in, and the example posted had the "rec level" set at 100. The input meters on the H2 were showing nothing near clipping, peaking at maybe -12. No matter how I had the inputs set, I couldn’t get clean line level audio into the H2 except by feeding it an extremely low signal level, with peaks well under -12dBfs. I could avoid clipping at those levels, but then once boosted back up to a normal range in a digital editor, the noise floor would come up with it. I read through the Zoom forums, and saw all of the tips and work-arounds, and tried them, but didn’t find them to help me get an acceptable sound. Was the review sample defective? Several of the comments in the review seem very odd compared with my experience. I’ve done tests recording a barely audible ticking clock in a very quiet room, and the H2 manages that fine (using its internal mics on the mid sensitivity setting, level 100) with no significant noise. I’ve used that same level setting for professional choir and pipe organ with fine results too. Line in is distortion free up to the indicated clipping point – tested with graduated test tones and music. The problem reported with external mics is however very true – the mic input is bizarrely noisy in contrast to the internal mics and the line input. First off, thanks to Jeff Towne for mentioning my plug-in. Second, if anybody tried it and thought "the darn thing doesn’t work", you were probably right… I’ve been recoding my plug-ins in the last few weeks and I broke the Zoom2Five in the process. The new repaired and improved version is now available for download. Is the internal speaker in the Marantz 620 usable or is it really bad? Is it about the same quality as my Mac G4 14" iBook? I want to use it as a songwriting sketchpad kind of recorder for when I’m away from my studio and retire my Sony hand held Cassette Recorder (YUK!). So many of these small dig recorders have only a headphone out and the speaker idea makes it more convenient for me. I’m not expecting great fidelity naturally but how bad is it? What where they thinking ? I am looking forward to the review on the 620 and it appears it might be the way to go for audio interviews which is my primary application. But why in the world did they put the headphone jack on top of the mics ??? That makes no sense to me and would the headphone cable noise get picked up by the mics ??? A great review of the H2 Jeff. I just got one myself. Like any recorder, it has it’s flaws, but I think I can work with them. This would be a great recorder for someone starting out without much money (no need to buy a mic). It would be great for travel – light – simple – easy to find batteries. And great to have around as a back up in case something goes wrong with your big heavy recorder while you are in the field. Handling and wind noises are problems though. The first time I took this out on the street the foam cover popped off and blew away. I could buy a fancy one – and some spring-loaded grip to reduce handling noise – but these seem like things I could make myself. I’d be interested in instructions and advice (or links) if anyone has done this sort of thing successfully. does it work, stand alone, as a 2 trac mixer? In other words, can I record a piano trac and separately record an accompanying vocal trac later? If not what is the best comparable pocket recorder that will do this, do you think. I just bought this thing… now how do I use it? So which sound quality should I be recording on? I don’t really want to waste a ton of space on my hard drive unnecessarily, but I’d hate to submit a story to the folks at This American Life, and get it kicked back because the quality wasn’t high enough. Any thoughts? Can this recorder capture professional-level quality interviews? If you want to eventually broadcast what you record, use the uncompressed .wav format. It takes up more space, yes, but using MP3 runs the risk of introducing weird digital artifacts along the broadcast chain. Start with the best you can get. I’m having problems getting my Zoom H2 to be recognized on my MacBook Leapard system. Any suggestions? I’m hoping to use it for interviewing and editing with Audacity. Thanks! good for 2 person interview? Like the person above, I’m interested in capturing broadcast quality interviews. Setting the H2 on a table between the two speakers and using the internal front and back microphones seems pretty appealing, but I’m concerned that the sound quality of final product might not make the cut. If I follow all of the suggestions can the issue of low "levels" be overcome? Should I be using an H4 with condenser mics instead? is it good for professional recordings? I’m a voice over talent and I travel a lot, I would like to know if this recorder will give me the SAME results as if I’m recording in my studio at home? go to the download site of zoom and download the newest system. Should help. Hi, I recently had a beginning audio student buy an H2. He is getting really low levels even when the everything appears to be set at the highest volume. Any thoughts? Thanks! Chaela – we might need more details: is your student using the bulit-in mics or an external mic? There’s a three-position sensitivity switch on the side, marked L-M-H. That’s low, medium and high gain, if there’s not enough level, the switch may need to be in the M or H position. There’s also a gain control in a menu, I’d suggest leaving that near 100 when possible, perhaps a bit up or down to optimize the levels. If an external mic is being used, make sure it’s plugged into the external mic input, not the line input. (But as mentioned in the review above, I wasn’t really able to get good sound from an external mic, but the built-ins work great. Most of these little recorders are designed for recording somewhat loud events, so a quiet conversation, or subtle nature sounds, etc might not record really well even with all the inputs turned all the way up. Try moving the recorder closer to the sound source (if using the internal mics.) If using an external mic, get the mic in closer, or try a higher-output mic. If using the built-in mics, make sure the right pair is turned on, there’s a red indicator light that will show which mics are active, or one should certainly be able to tell by listening on headphones. But make sure that the correct mics are selected, there’s a pair that point forward and another pair that point backward. One could certainly get low levels if the mics are pointing away from the subject! And remember, one needs to address the side of the mic, not the end, you can’t point the end of it at the subject, one needs to face one of the wide sides of the mic toward what’s being recorded, and make sure that the appropriate pair of mics is activated. Ultimately, I think the H2 works really well using its built-in mics, not so much with externals, so I’d go with its strengths and use it when the built-in stereo mics are appropriate. Monitor on headphones while recording, and make sure it’s positioned optimally. One may need to angle the mic a bit, or move it closer or further away. The crucial thing is to listen WHILE recording and make adjustments then. Thanks for a really comprehensive review! I’m just wondering if you have any spectrogram images of the voice recordings you made above? They sound great, but as a professional linguist, I’d be interested in seeing what the sounds looks like, if that’s possible. The F and R files happen when you are in 4-Channel mode, recording from the pair of mics pointing out the front of the recorder, AND the pair of mics pointing out the rear of the recorder. As you might have already guessed, the F is for the Front mics, and the R is for the Rear mics. Which do you use? The file that sounds better… Or depending on the situation, you might want to use both, if you positioned the recorder in the middle of the action, and interesting things were happening on all sides. It’s a little bit of a challenge deciding how to pan those tracks in the left-right spectrum, unless you’re mixing in surround-sound, but just experiment a little… The H2 does not always record both F and R files, you can set it to record just one stereo file from either the front mics or the rear, or both pairs of mics mixed together. The front-facing mics (pointing out from the side with the display screen) are angled at about 90 degrees, while the rear-facing mics are spread further apart, about 120 degrees, so the general idea is that the front mics are good for general stereo recording, the rear mics are better when recording very widely-spaced sounds, for instance a large choir. The 4-channel mode is handy when sounds are coming from all directions, for instance if one is recording in the middle of a parade, or if the recorder is placed in the center of a round-table discussion. You can set the record mode by clicking the arrows below the display screen until you get lights under the names of the mics you want to have active. Just to make it even more complicated, the update to the H2, the H2n, has all those modes and an extra one – M/S stereo, so just be careful to be sure you’re using the mics that you want! I use the H2 to record company meetings to take accurate minutes of those meetings. without having to go all the way back to the beginning. Can this be done with the H2? Please advise as simply as possible. I’m not the greatest technician and I really hate reading manuals. 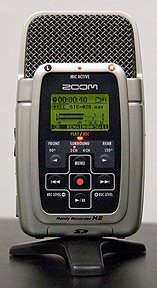 plugging into the Zoom H2 external mic, can i record in 4CH Surround mode using two built-in mics AND the external mic at the sime time? My aging H2 seems to have forgotten how read read the SYS folder and always looses the presets that I select. When I checked the SYS folder it has a file called “MACPRM.ZIF”. Is that all that needs to be there or is something lost? Thanks. Got it worked out. A software update seemed to do the trick.